Backconnect socks are the smaller level of proxy which behaves like a circuit to provide you security over the internet. Socks are not a normal form of proxies these are specially designed for the applications. Like when you are sending the request on the HTTP this request is basically forwarding to the proxy of HTTP. Then it will respond you on the behalf of HTTP. Socks are basically getting attach with the firewall and make a tunnel then firewall respond for each request sent on the internet. When request received it basically goes to the socks and the socks then respond to the request with the help of protocols. The client sends the request to the proxy of the sock and exchanges the message which he wants to give. This creates the negotiation between the protocols. On the result the connection is generated to the internet and client can work easily over the internet. After completing the work connection request can be changed easily. If you are not the actual client you cannot get into the network. This is the secure method if the hacker will try to connect he cannot connect from your network. When you are using socks this protocol must install on your computer in the form of some software or in the stack of TCP/IP protocols. For the connection, the client sends a request and the protocols. These protocols first confirm the authenticity of the user. When the client is connected the socks server become the client to send the requests on the internet. External servers will only know about the sock server nothing else. This will make user anonymous over the internet. This method is quite natural. If you want to be safe on the web you can use backconnect socks in your internet connections. 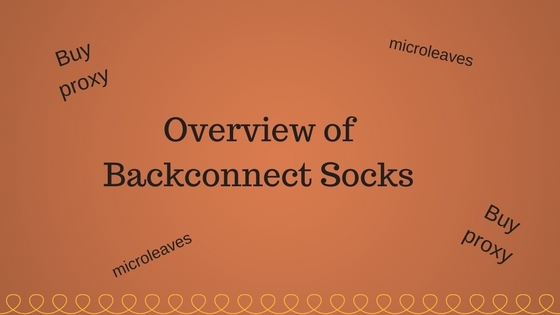 We are enlisting some of the features of backconnect socks for your awareness. This will make your internet decisions more secure. This is the basis of your internet connection which never gives the look of artificial internet connection. Proxies are somehow looked artificial when connected to the internet. Socks are working in the depth when connected to the internet that is the reason it is more difficult to catch the users of these protocols. The cost of the socks is not really high because they are purchased for once. Some companies are giving high cost but they are also not offering very high quality. Be smart when you are purchasing socks for your internet connection. Backconnect by Microleaves is the smarter decision with budgeted cost. When we are using proxies internet speed get slower because they first ask from proxies and then proxies connect to the internet. Socks are same like the direct connections and experts are using them with direct connections. These are most of the time use for testing and troubleshooting purposes that is the reason they are giving real internet speed to its users with the security shield.